Hearing is the gatekeeper to human communication — it is one of the primary ways in which we connect with other people. Those of us who hear clearly probably cannot appreciate how difficult hearing loss can be. It can even lead to isolation and withdrawal from many pleasurable activities. 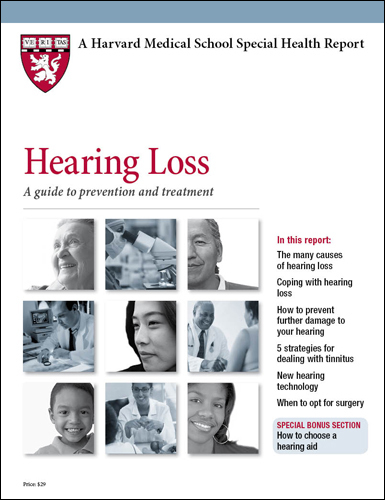 You can help protect your hearing, starting today. The most important thing you can do is protect your ears from loud noises. Any sound that's loud enough to hurt your ears, prompt temporary hearing loss, or cause ringing in the ears can destroy hair cells and lead to permanent hearing loss. Such noises include leaf blowers, lawn mowers, wood chippers, chain saws, snowblowers, and some household appliances, like vacuum cleaners and blow dryers. A sound's intensity is measured in decibel (dB) levels. Decibels are not precise units of measurement, like feet or yards, but rather a scale of progression. Every increase of 10 dB is significant — it's not an additional 10 units but rather 10 times the original decibel level. The softest sound that an adult with normal hearing can hear is 0 dB, and the loudest sound, the sound of a rocket taking off, is more than 180 dB. When you know you're going to be exposed to loud noise, wear earplugs, earmuffs, or both to lower the decibel levels. Earplugs or earmuffs each can reduce the loudness of sounds by 15 to 30 dB. Earplugs work better against low-frequency noises, while earmuffs offer more protection against high-frequency noises. When you know you'll be exposed to loud noise for an extended period, wear earplugs and earmuffs together for the best protection. Such noise includes a jet plane that's taking off or landing 100 feet away or a shotgun blast. If you use stereo headphones or earbuds, keep the volume at a reasonable level. Don't turn it up in an attempt to drown out other noise in the room. The volume on some portable stereos goes up to 126 dB, which is comparable to the ear-piercing noise of a jackhammer or chain saw. If you use earbuds, consider switching to headphones that muffle outside noise — that way, you can hear your music better at a moderate volume. Identify work areas with potentially hazardous noise levels. Take steps to control this noise. Schedule regular hearing screening tests for employees. Require employees to wear earplugs, earmuffs, or similar ear-protection devices. Educate workers on the dangers of loud noise. Make sure workers with hearing loss get the proper care to help prevent further hearing damage. Aside from guarding against exposure to loud noise, you can do other things to conserve your hearing. If you are hearing impaired, have your hearing checked yearly. If your hearing has deteriorated since your last test, it's important to know why, so that you can get proper treatment. For example, you may need to have your hearing aid reprogrammed or replaced with a new, more powerful one. Some experts think that maintaining a good level of hearing can slow further hearing loss by keeping the brain attuned to signals from the auditory nerves. Finally, don't smoke. If you smoke, try to quit. Avoid being around others who are smoking. There's some evidence that smoking and secondhand smoke can increase the risk of hearing loss, as well as many other health problems. Research in animals has found nicotine-like receptors in hair cells, which suggests that smoking may be toxic to these cells. Smoking may also impair hearing by constricting blood vessels and restricting blood flow to the ears. Although some studies have not found a connection, one found that current cigarette smokers were 70% more likely to have hearing loss than nonsmokers. In all, 15 studies have looked at the effects of smoking on people's hearing, and nine have found smokers to be at increased risk of hearing loss.